Using the generous grant received from the Anglo Israel Society I was able to take part in this years’ excavation season at Tel Bet Yerah, located beside the Sea of Galilee. With several thousand years of settlement accumulated across the mound, it is the significant Early Bronze Age levels that have been the focus of this research project co-ordinated by Tel Aviv University and University College London. The large urban centre from this period marks an important stage of development from the earlier small-scale villages of the region. This years’ excavations continued to investigate two distinct domestic areas excavated during the two previous seasons, which are set apart by their differing pottery traditions, as well as their differential treatment of faunal and plant remains. The team this year was relatively small, consisting of around 20 undergraduate students from UCL and a few students from Tel Aviv University. 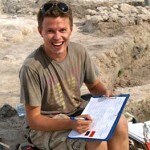 Having excavated there previously in 2010, I was able to increase my responsibilities to a supervisor/student co-ordinator and also pursue my developing interests in environmental archaeology. The excavation team was split across the two areas and I helped to supervise the eastern SA-M trench with Mark Iserlis. The upper levels of this trench were in the EB III period, which is contemporary with the well-known ‘Circles building’, and is the source of significant quantities of the Khirbet Kerak ware (KKW) pottery. This distinctive pottery type, which can rarely be found in the domestic spaces of the nearby western SA-S trench, is believed to represent the material culture of a non-local migrant group; the pottery style more closely resembles the ceramic cultures of Eastern Anatolia and the southern Caucasus region. Previous seasons had revealed substantial evidence for differing activities associated with this pottery, such as pieces of cooking andirons, metal fragments and bead craft, yet the lack of architectural features in this area further suggests more temporary forms of settlement. While the discovery of new features was minimal in this area compared with the western SA-S area, this years excavations began to uncover several EB III floor layers, which included further concentrations of KKW pottery, andiron fragments, beads, metal work, and were often rich in organic material. Many of the deposits were extensively sampled for archaeobotanical recovery and wet sieving, and I therefore spent a greater portion of my time processing the large volume of samples towards the latter part of the excavation. The archaeobotanical remains were of particular interest this season as recent analyses by Alice Berger, a postgraduate student from Tel Aviv University, revealed notable differences between the treatments of plant food supplies in each area. While the macrobotanical remains from SA-S largely comprised of cereal grains and little chaff, suggesting their extensive processing for storage, the SA-M data on the other hand was rich in chaff and weedy species, indicating minimal levels of processing. This is yet another aspect that distinguishes the two different communities represented by each area. The flotation system, which I helped to run for most of the excavation, was carried out by a simple manual bucket method. This system has been used in prior seasons, and while appropriate for the earlier stages of the excavation, with its effective extent of recovery, it was difficult to keep up with the processing of larger volumes towards the end of the excavation. However, due to the great amount of strain it put upon time and resources, we were able to convince the project to construct a mechanised flotation tank for future seasons. This will enable us to process much larger volumes more efficiently. While the remains from this season are still to be analysed, this challenging process of archaeobotanical recovery has provided me with invaluable experience, which has greatly prepared me for future archaeobotanical work. My participation in this year’s excavation at Tel Bet Yerah, an Early Bronze Age urban centre on the banks of the Sea of Galilee owes huge thanks to the grant I received from the Anglo Israel Society. I have excavated at the site the previous two seasons (2009, 2010), and this year I was given a more supervisory role under Dr Sarit Paz, the co-director of the excavation and supervisor of Area SA-S where I was working. This season was relatively small with a group of 20 or so UCL students forming the core of the excavation team under director Professor Rafi Greenberg. Half of the team worked in area SA-M alongside Mark Iserlis of Tel Aviv University to investigate the occupation by the “Khirbet Kerak” migrants of the EBIII city and further illustrate their migration and subsequent settlement at the site following the close of the EBII. The other half of the team worked alongside Dr Sarit Paz and myself where our excavations focused on the native population of Bet Yerah in the EBII and EBIII, providing some interesting comparisons between the native inhabitants of Bet Yerah and the KKW migrants living contemporarily just a few meters away, across the street. Whilst the excavations in area SA-S were primarily focussed on an Early Bronze Age domestic suburb at the centre of the urban settlement, at one stage during the excavations, we were excavating parts of the Islamic Palace, the winter resort of the Umayyad Caliphs, and Hellenistic remains, in addition to the EB II and III remains. One of the principle aims in this year’s excavation was to continue excavating the EBII levels to gain further understanding of the connections between the site and early Dynastic Egypt. We found a number of different destruction layers, mainly of the EBII which proved difficult to interpret and will be further investigated next season, when, hopefully we will get a clearer understanding of their significance. Our efforts then moved to another part of the trench, where in the last few days of the season, we found that the Hellenistic pit we had all thought had destroyed all evidence of the EBIII occupation in the area had caused less damage than we anticipated. The pit itself was cut into the centre of the room and had destroyed all evidence of the EBIII in this space, however at the corners of the room we made a number of hugely interesting finds, and indeed, the Hellenistic activity had not destroyed all of the EBIII archaeology at all: In the SE corner of an adjoining room we found a huge Holemouth jar sunk into the floor, clear evidence of large food storage. In the SW we found a cache of a number of different platters and platter bowls, and in the NE corner came the most interesting find; this was the location of two huge EBIII platters, the largest being 60cm in diameter and beautifully red slipped and pattern burnished. The platters both had drill holes in them, clearly showing that they were in the process of being mended and put back together before some disaster, possibly an earthquake, destroyed the room they were housed in, and buried them. The platters formed the core of my MA thesis in which I looked at platters in considerable detail, their chronology throughout the EBA, their geographical spread, and examined in detail their use within feasting situations. The uncovering of these platters, and the other dozens from other locations in our excavation this year provided me with invaluable information regarding further research and study, particularly at PhD level. For this reason I am hugely grateful for the grant I received from the Anglo Israel Society for allowing me to continue to develop my knowledge of the archaeology of EBA Israel, and of the archaeological methods of modern Israeli archaeology. I owe further special thanks to Rafi Greenberg, Sarit Paz and Mark Iserlis for welcoming me back to the site, for giving me a more supervisory role and thus allowing the development of my understanding of the archaeology of this fascinating site. The tomb complex at the Ecole Biblique, Jerusalem, where the entrance to an Iron Age tomb complex meets with the Dominican chapel, and where some highly influential scholars are buried, such as Roland de Vaux. My trip to Israel and the Palestinian territories forms part of the research for my PhD project, looking into Israelite and Judahite responses to death in the Hebrew Bible and it’s contemporary material culture. Firstly, I visited a series of mainly First and Second Temple period tomb sites, in order to better understand the burial culture and the changes in practices over time. This included consulting archaeological records to establish where these tombs were located in relation to their relative population centers. The most striking site was the necropolis at the village of Silwan, which was an unparalleled opportunity to grasp the geographical relationship of death sites to the communities that created them, as well as their vast size and scale. I visited (often begging, or on one occasion bribing!) other sites such as the so-called ‘Tombs of the Kings’ north of Damascus Gate of the Old City of Jerusalem, the tombs at Ketef Hinnom, the Kidron Valley and others. To compare and contrast sites through different stages in burial culture, from the 8th or 7th Century BCE tombs at the Ecole Biblique to the 1st Century BCE Tomb of the Prophets on the Mount of Olives to the later necropolis at Beit She’arim gave me a striking impression of how burial culture changed over time and the ways it may have been combined with cultural understandings of death and afterlife (Fig. 1). The second part of my research involved visiting a series of tombs still in use today as pilgrimage sites, many of which claim continuity with sites mentioned in the Bible, in order to further understand how tombs are used as sites of religious and political identity. The two most contested sites I visited were the Tomb of Rachel in Bethlehem and the Tomb of the Patriarchs in Hebron, the control of which has become a fierce matter of debate in both the Israeli and Palestinian narrative. Understanding the political geography, discussing the tombs with pilgrims and reading the recent history of the sites contributed greatly to understanding how tombs and ancestors are a strategic method of forming identity and political capital in order to make claims to land. This research contributed to two of my main research interests: the use of archaeology and biblical sites in contemporary Israeli and Palestinian discourse; and the application of anthropology and other material to understand the importance of tombs and ancestors in the biblical narrative. 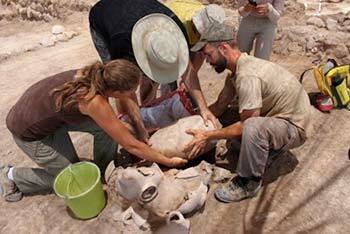 The opportunity to visit these sites has dramatically increased both my understanding of burial culture in ancient Israel and Judah but also intensified my interest in what material culture can tell us, as well as the extent to which archaeology can be both interesting and important in its own right. 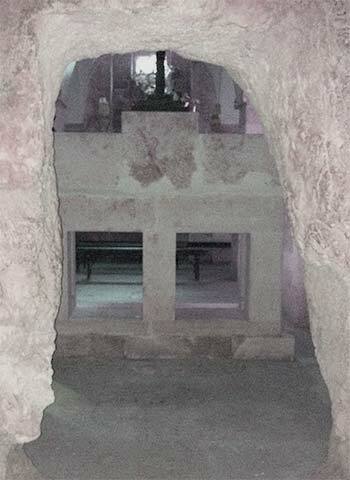 One of my first visits was to the Cave of Nicanor; when discovered, the site was a preserved ancient burial site maintaining the burial traditions of secondary temple period, then it was thrust into the 20th century as a political and ideological tool as a proposed pantheon for early Zionist leaders. Potentially, I would never have visited had it not been for the AIAS lecture by Yair Shapiro earlier this year; but thanks to the brilliant series of lectures and the generous grant to enable my trip, I was able to see these different dynamics of material culture, history, religion and politics in action, and understand how archaeology is both a window onto the ancient world but also onto our own. Jess is assisting the removal of a large pottery vessel in Area D where the Philistine ‘‘lower city’’ is located and extensive Iron Age IIA levels have been exposed. Among the finds excavated were 120 loom weights, many complete pottery vessels of different types,various small finds and a short inscription. Thanks to the grant from the Anglo-Israel Archaeological Society I was able to participate in the 17th season of excavation at Tell es-Safi/Gath directed by Aren Maeir of Bar Ilan University. It is a large and impressive site overlooking the Elah valley in southern Israel, famed for being the Philistine hometown of Goliath! 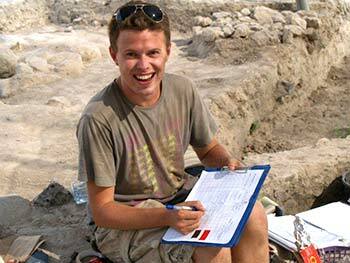 This year’s excavation team was the biggest on record with members coming from all around the world including Australia, Canada, America, Austria, Poland and so on. Among the major finds of the season was the discovery of a Late Bronze Age fortification wall unearthed in Area P of the southern part of the tell. It measures roughly 2.5 m thick, complete with insets, offsets and a square tower running parallel with two buildings where lamp and bowl foundation deposits were unearthed. These finds are particularly significant given that not many Late Bronze Canaanite settlements were allowed to have fortification walls due to Egyptian Imperial policy. A memorable moment for me was finding a faience bead and some phytolith layers (plant matter) in the structure adjacent to the fortification wall (Fig. 1). A lot of effort was involved in removing the winter wash and cleaning the balks since this area suffered badly from erosion as it is situated on the steep slopes of the southern side of the tell. Excavations in Area F (lower and upper) were focused on exposing more of the Crusader fortress known as Blanche Guard (defended by a dry moat), whereas, Area E concentrated on revealing more of the extensive remains of the Early Bronze neighbourhood. Vast quantities of loom weights, miniature pottery vessels and various small finds including a stone figurine of a dog were among the treasures unearthed in the Iron Age II levels of the Philistine lower city in Area D (where the celebrated four horned altar was found last year). I was very fortunate to participate in the Tell es-Safi Archaeological Science Field School organized by the Weizmann Institute and received training to use an on-site laboratory. I learnt to use the fourier transform infrared spectrometer for identifying and characterising sediment samples. This technique draws on the microscopic record to flesh out a more detailed picture of the history of the site. One of the long-term goals of the Weizmann science team is to provide absolute dates for the Late Bronze and Early Iron transition and I was privileged to take part in some of the fieldwork. Everyday we arrived at the tell at 6am to set up the onsite lab, followed by six hours of fieldwork in groups before journeying back to the Kibbutz for a big lunch. The afternoons were mostly spent using the main lab at the kibbutz to complete our analysis of various sediment samples, integrating our results into a broader archaeological picture and planning our work for the next day. Our findings were then shared and discussed among the rest of the groups before dinner. Finally, lectures were held most evenings to elucidate different aspects of the excavation process whilst giving a history of the region with plenty of time for questions. My own goals were to further my MA dissertation research on the mechanisms of cultural change in Iron Age Philistia (Fig. 2). I was overjoyed to receive several articles by leading scholars on this very subject (currently in press) and I was able to take advantage of their views and opinions. In addition, I lost my apprehension of the application of material sciences in archaeology and feel inspired to continue my research interests in the Late Bronze and Early Iron Age Levant. Meeting various renowned scholars and touring different locations I often read about (Tell Qasile, Khirbet Qeiyafa and Jerusalem) whilst learning how research is gathered from the field has proved to be a truly memorable experience. I look forward to returning one day in the future and I am very grateful to the Anglo-Israel Archaeological Society for making this trip possible.